Michael Mayer’s glamour makeover also included his years long battle to get me to go into therapy. Someone once told me that if I did some work on the “inside” the “outside” would take care of itself. Funny how people you might only know for twenty minutes can leave you with something you’ll remember your entire life. So I went to Denise Phillips. How did I pick Denise? She was a friend of Michael’s, she had a practice, and one time a few years earlier I dropped something off at her office for Michael. I had tickets to see Whitney Houston at her first appearance in Carnegie Hall and Michael had a friend who had seen the show and he convinced me to sell the tickets and his friend Denise would take them. I noticed in the lobby directory the listing for “Cis Corman Casting”. I kid you not. 80 East 11th Street, by heart, like ‘The Pledge of Allegiance’. So, when it was time to enter therapy I took that as a sign… if I’m going to do this I might as well go back to Denise. I was not a very good patient. I never learned how to talk about myself. I would ask Denise questions for forty minutes and then get pissed off that the session ended so quickly. Denise said I was a master at “door knob therapy”. That means I said more with my hand on the doorknob leaving than I did sitting down. In order for me to open up, Denise gave me this book called ‘Father Loss’ by Elyce Wackerman. This was a book about women who had lost their fathers when they were still very young. Denise suspected correctly that a lot of what I had to say would be connected to this topic. I started reading it on the subway back to Jackson Heights. These were terribly sad stories. Girls coming home from school to hear that their father had died just like that, women who never knew their fathers, etc. I don’t know where all this emotion was coming from but I just sat on the subway and cried and cried and cried. But I kept on reading. I was actually in physical pain from so much crying. I connected with these women so much that I was reliving my own loss – which I thought I had settled. I thought of my sister who had gone through the same loss I did but we never spoke about it. I didn’t mind crying on the subway. I used to walk down the street weighing 353 lbs. and people would point at me and snicker and talk about me as I passed – do you think I care if someone sees me cry? What other people think of me has become the least of my worries. I thought I would have to get off the subway just because the pain was so bad. My head hurt, my sides hurts, my legs hurt, my skin hurt if you can believe that. The stories I was reading were heart wrenching. I had to close the book. And there it was. On the front cover. The words ‘Barbra Streisand’. 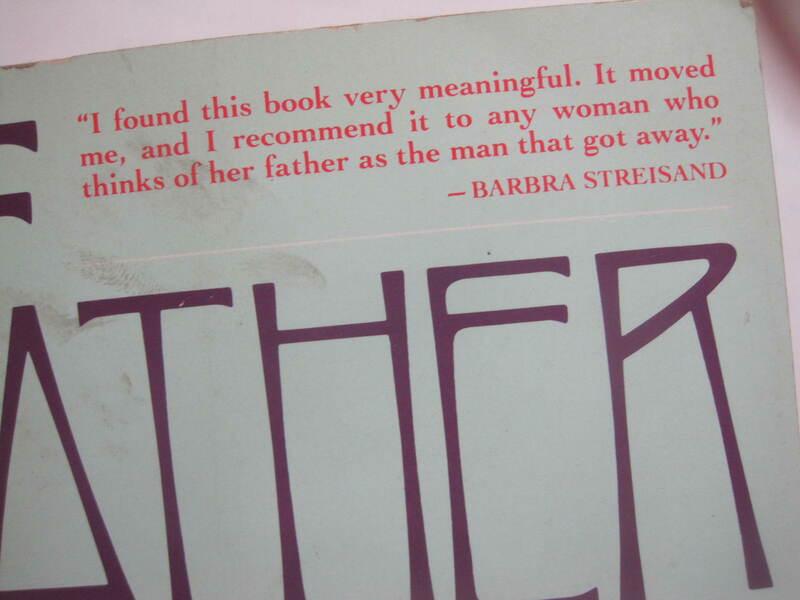 Barbra had contributed a quote for this book and I hadn’t seen it when I first opened it. “I found this book very meaningful. 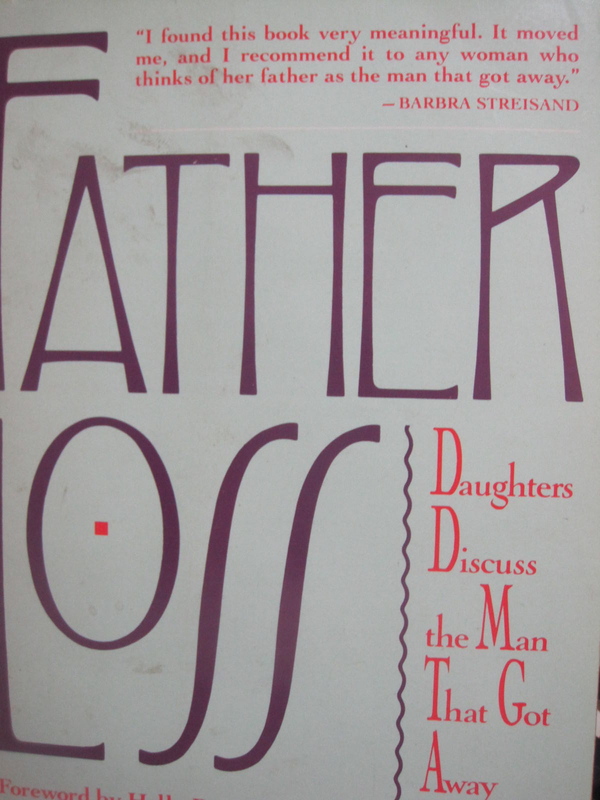 It moved me, and I recommend it to any woman who thinks of their father as the man that got away.” Barbra Streisand. I didn’t stop crying but I was able to retain some control. I had to blink away some tears and re-read Barbra’s quote just to make sure I was not imagining it being there. But there it was. She has always been there when I needed her. I never opened that book again. I don’t know if Barbra is mentioned in other parts of the book or not and I don’t care. I never returned the book to Denise. I wanted to protect other clients from having to go through the same experience. I don’t think Denise liked that too much but she trusted me and didn’t press the issue. Anyone who ever says that Barbra Streisand cannot act or direct please have them see me. Immediately. I had been seeing Denise Phillips for about a year when I was finally able to talk. The big reveal. I remember years later when I first saw ‘The Prince of Tides’. Tom Wingo’s big confession scene. I lived through that. I swear to God the look on Denise’s face was the exact same as the look on Barbra’s (as Susan Lowenstein). I could not believe it. Imagine being a therapist, here you are, a professional, listening to this story, but everything in your training says you cannot react, you have to stay in control, and you have to keep probing. Barbra played this beautifully. She had to keep the look of ‘horror’ behind her eyes and not breakdown with Tom Wingo. This was the most amazing screen thing I had ever seen. And she had to direct it too? The amount of courage and effort that went into this I cannot even begin to image. She cannot betray her emotions but they are right there – all over her body. To be a psychiatrist and to finally hear the story that everything else in a clients’ life is based on? The defining moment – the turning point in someone’s life. You cannot celebrate this break-through. What a terrible story. And you can’t wish you never heard it because what are you sitting in that chair for in the first place? But at least now you can get on with the work that you’ve dedicated yourself to and try to show your client that yes, their life may be scarred but it is not over, and that every day builds on the last. Incredible. Incredible. Incredible. Barbra’s direction and acting of that scene was for me the corner stone of not only the movie, but also her career. She was perfect. Letter perfect. I was, and still am, so amazed at her craft. ‘The Prince of Tides’ was too good. That’s why people thought it directed itself. I may have fallen for Barbra Streisand because of her looks, she might have saved my life because she was beautiful, but her mind never ceases to amaze me. Denise might feel my time was wasted with her. I do not. I think of her often. No film directs itself.